This is the first of a three part series that will deal with how to plan for the eviction of a tenant. Part 2 of this series will discuss planning and preparation for trial and Part 3 will discuss what to expect on the day of trial. Litigating California Unlawful Detainer cases has come out of the dark ages. 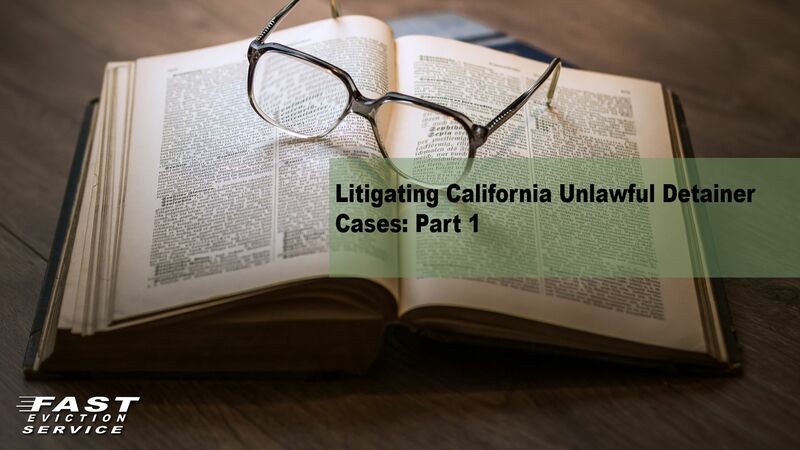 What once had been thought to be a rather simple and expeditious procedure has become much more complicated and regulated by the trial courts in the Superior Court of Los Angeles, making pre-litigation planning for every landlord much more important. Today, when you go to trial in the County of Los Angeles, whether it is a jury trial or a bench trial, you must be prepared with a Witness List, Exhibit List and a Trial Brief. Each exhibit that is intended on being used during trial must be attached to an Exhibit List, tabbed and placed into a three-ring binder. The Los Angeles Superior Court is also requiring that you bring to trial at least three copies of your exhibit list fully tabbed and bound in a three-ring binder. This will be fully discussed in part two of this series. What Do I Need to Prepare for Trial? Planning for the unfortunate possibility of an eviction trial should begin at the very inception of the tenancy. The following documents need to be kept and updated in each tenant’s file folder. This can be kept in a digital folder, but these documents must be accessible if an eviction case needs to be filed. A good rental application that requires the prospective tenant to provide current information for all persons who intend on occupying the rental property will assist in any Unlawful Detainer case in the future. Once the rental application is completed and the prospective tenant has been accepted a current up to date written rental agreement is a very important tool in the Landlord/Tenant relationship. While oral rental agreements are still accepted by the court I have found that a solid written rental agreement eliminates any confusion on what the parties expect and how their relationship will be governed. It is also important to remember that over time memories fade, and the exact terms of an oral rental agreement may be somewhat fuzzy when it is time to evict the tenant and go to trial. A good up to date rental agreement can also be a very useful tool when you need to evict the tenant. It can provide all the information necessary as to evict a tenant for non-payment of rent, breach of a covenant – such as unauthorized number of tenants and maintaining the rental unit in a clean and sanitary condition – and many other reasons for terminating the tenancy. The landlord should also keep and maintain a rental ledger that lists the security deposit, rent charges and other non-rent related fees and charges. Every time a landlord wishes to change the terms of the tenancy, such as increasing the rent, changing the date of the rent payment, or any other term of the agreement a California landlord must serve a Notice of Change of Terms of Tenancy. This document should also be included in the tenant file. Finally, any type of communication between the landlord/tenant, whether letters, emails, and/or text messages should also be maintained in the tenant’s file. There are many other documents that should also be maintained during each tenant’s tenancy, but those documents can be maintained in a general property file for each property. These documents include, but are not limited to, inspection reports, citations and warnings issued to the owner, LARSO registration and annual renewals, and fees paid to any governmental agency. The documents and information a landlord keeps for each property and for each tenant can be of great importance when a landlord is required to prepare a Notice of Termination of Tenancy. An accurate Notice of Termination of Tenancy can mean the difference between winning and losing an Unlawful Detainer case. Part Two of the series will discuss the steps it will take once the eviction case is filed to prepare for trial.